A trickle charger provides a more sustainable charge than a quick jump start. Learn about the benefits and best practices to using a trickler charger. A trickle charger is a car battery charger designed to be left on a car for a long period of time to re-charge the battery. It slowly adds the charge to the battery and does not allow for the normal depletion of charge that batteries commonly have. There are differing opinions of how long a trickle charger can be left on a battery and for that reason, different types have been manufactured. Some trickle chargers can be left on a battery indefinitely. These would be used on a vehicle that is not used all the time or is stored away for the winter or the summer. 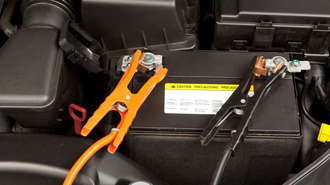 A trickle charger built specifically for this is left on in the event that the vehicle is needed in an emergency or other unexpected situation. It keeps the battery from being depleted from non-use. Trickle charges employ the use of a battery regulator to regulate charging rate and prevent overcharging, charging your vehicle's battery at a rate similar to the rate at which it self-discharges so as to maintain full battery capacity. Charging at too fast of a rate or overcharging can cause damage to the battery. Using a trickle charger is very easy. Most trickle chargers consist of a simple box (where the "guts" of the charger reside), a power cable and two alligator clips. Before connecting everything, be sure to set the voltage and amperage appropriate for your battery. Check the switches and buttons on the charger box and set them prior to connecting the charger to a power source. Before you begin attaching your charger, it is important to ensure that all safety precautions are taken. First, it is important that your vehicle is parked in a place free of rain, and well ventilated. The charging process can produce excess hydrogen gas, and if allowed to concentrate in an enclosed structure, an explosion or fire can occur. Make sure the ignition of the vehicle is turned off and the key is removed, and that your charger is unplugged. Finding a suitable location to attach the negative terminal of your charger is the key to safe and effective completion of your trickle charger circuit. Ideally a spot of bare metal on the frame, or a large bolt attached to the chassis or engine block should be used, but if one cannot be located, a section of the frame that is free of excessive dirt, grime and oil will suffice. The negative terminal on the battery should never be used, as it can cause an explosion or fire. Connect the alligator clips. There should be a black clip and a red clip. Take the red or positive cable and attach it to the positive terminal of the battery to be charged. Once you have ensured you have a solid connection, connect the black, negative wire to your ground location located in step 2. It is important to ensure that this negative wire is solidly attached before plugging in your charger. Do not touch the wires while the charger is plugged in and turned on, as serious shock or injury may occur. Once everything is in place, connect the trickle charger to a power socket. Once your connections have been made, ensure that all of the proper settings are set as per the manual's recommendations for the type of battery you're charging. Plug in your charger and set it to the "On" position. Most battery chargers have an amp meter that will read higher on a dead battery, and lower to 0 on a fully charged one. If this meter reads low, your battery may not need a charge, or your ground connection may not be adequate. Turn off the charger, unplug it and retry the connection if this problem occurs. Check the charger's display to make sure it is charging properly. If it fails to begin charging after a few minutes, your battery is mostly likely dead and beyond recovery. Otherwise, keep the battery charging until it is full. Some trickle chargers can safely be left connected for months without doing harm to your battery, providing an easy long term battery maintenance strategy. Others may only be left connected for a few days at most. Be sure to check your trickle charger's manual for details. The one amp trickle charger is used for charging your motorcycle battery, your golf cart and other small things of the like. A motorcycle battery will lose one percent of its charge everyday just doing absolutely nothing. So leaving your battery uncharged will likely kill your battery. At the same time, overcharging it will kill your battery. The two amp six and twelve volt battery trickle charger has the convenience of multiple battery connectors. It charges motorcycles, lawn tractors, ATVs and snowmobiles. This trickle charger can charge small batteries or large batteries, and can even be used for classic or antique batteries. It has two different charging settings. There is a two amp trickle charge rate for six volt batteries, and a four amp trickle charge rate for twelve volt batteries. It has a reverse hookup connection, with fifty amp clamps for top and side post batteries. There is a twelve amp plug in for charging car batteries, also. This trickle charger literally takes care of all your needs. How Long Does it Take for a Car Battery to Charge?